Monmouthshire CAMS Web is a joint project between exeGesIS and Monmouthshire Council to provide an online copy of their definitive map for members of their authority. The interactive web map is hosted by exeGesIS. 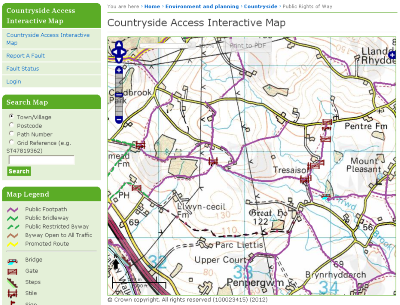 The web map is used by members of the public to report problems, search for local rights of way and other features of interest nearby. It lets users switch map layers (such as promoted routes or furniture) off and on and search for features on the map using an address or OS grid reference. It was fully integrated into the existing Monmouthshire Council website. All elements of the design were maintained, in addition to the corporate styling the backend of the site was fully integrated into the existing Monmouthshire system to provide a seamless experience for members of the public and council employees alike. For more information, please contact Simon Allen.